Bocce can be played on any open field or sandy beach using a set like this one from Amazon. Bocce ball was first played in ancient Rome and is derived from the Italian word boccia, to bowl. A game of bocce begins with a player throwing the little ball, commonly called a jack, to the other end of the court. Players then take turns tossing balls to get as close as possible to the jack. You don't have to know jack to play, though, it's an easy game to learn! Given its Italian heritage, one might pair bocce with wine, negronis or Peronis. 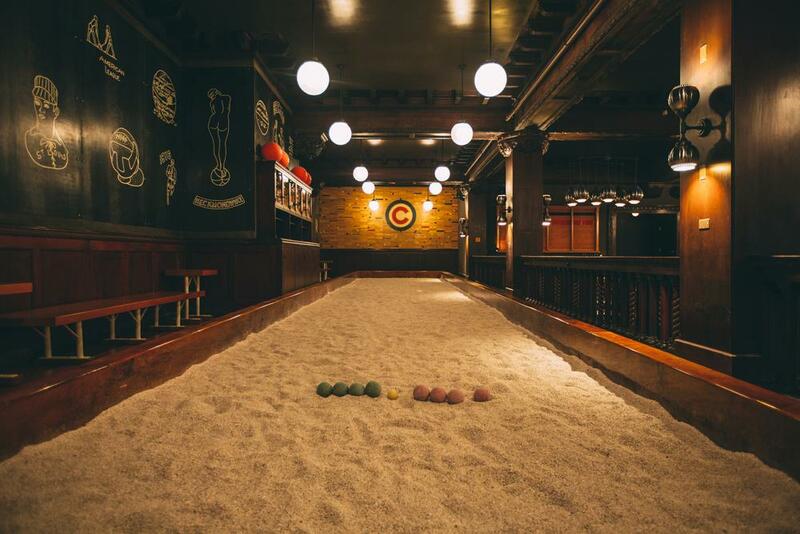 Here are Chicago venues where you can play bocce with a bevv of choice in hand. The Chicago Athletic Association's Gameroom is an adult's playland. If you can't have a ball here, something is terribly wrong. The bocce court is free and open to the public. Pinstripes is perhaps more well known as a bowling alley, but also allows up to 10 people to reserve bocce courts by the hour, ranging from $8-12 per person. This Streeterville bocce and bowling bistro is family friendly and close in proximity to Chicago's Navy Pier. Al Fresco Leaguers will love these outdoor bocce ball courts in Chicago. In West Loop, Saint Lou's Assembly has an outdoor court. Nearby Kaiser Tiger has an outdoor seasonal bocce court in their West Loop beer garden. The court is first come, first served, but groups of 30+ can reserve courts for events (beer olympics, anyone?). In the winter, the court transitions into Chicago's only outdoor curling court. A game of bocce also pairs well as a digestif. Letizia's Fiore (pictured above) and Three Aces in Little Italy/University Village have seasonal outdoor bocce courts for patrons to work up an appetite or work off dessert. The City of Chicago also has seasonal public courts available, in Clarendon, McGuane, and Hiawatha parks. If drop in games don't satisfy your competitive itch, there are also bocce ball leagues and tournaments to enter in Chicago. American Bocce Co. holds pop up events, leagues, and private events around Chicago. Select Thursday nights Chicago Distilling hosts bocce tournaments in its Logan Square distillery through American Bocce Co. Individuals or teams of 4 compete for the ultimate prize - a bottle of locally crafted booze! Chop Shop has bocce ball leagues, where teams of 4-8 players compete in 2 games per league night. Mad River runs a Monday night bocce league in Lakeview. Bocce league locations have also included the private rooms at Italian grocery, eatery, and brewery Eataly and the dog friendly outdoor beer garden at Clark Street Ale House.